Suzuki Motor Corporation (SMC) is pursuing a world strategy designed for long-term growth. Following the launch of its acclaimed fourth world strategic model, the Splash, at the 2007 International Motor Show (IAA) in Frankfurt, the company is developing the fifth exciting model in its strategy. 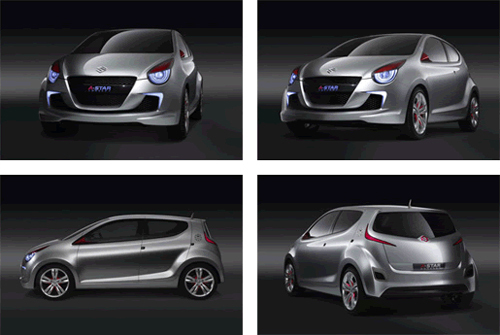 It will be showing some of the forthcoming model’s design themes at Auto Expo 2008 in New Delhi* in the form of the Concept A-Star. The forthcoming production model is an A-segment five-door hatchback reflecting a focus on world-class environmental compatibility and comfort. It will have a newly developed Euro 5-compliant 1.0-litre aluminium petrol engine with CO2 emissions lower than those of European competitors (target: lower than 109g/km). And like the already-launched Suzuki world strategic models, it will prove that sporty and exciting performance can be enjoyed together with outstanding fuel economy. SMC attaches great importance to India. Suzuki’s efforts have greatly contributed to the Indian motor industry’s development and have earned Suzuki a more-than 50% share of the burgeoning Indian market for passenger cars. Having been early to recognize India’s potential, it partnered with the Government of India to establish Maruti Udyog Limited (now named Maruti Suzuki India Limited, an SMC subsidiary), whose Gurgaon plant began producing cars in December 1983. Thanks to a quarter of a century of technological advances, personnel training, and adoption of superior production systems and quality standards, Maruti Suzuki India builds vehicles of world-class quality. The production model that inherits some of the design themes of the Concept A-Star will be manufactured at Maruti Suzuki India’s Manesar plant, to be marketed mainly in Europe and other countries including India. The start of production is scheduled in October 2008. Substantial production for Europe is targeted to start in December 2008, followed by expansion to other markets around the world. The new 1.0-litre aluminium engine will be produced by Maruti Suzuki India, and a manual transmission for it will be manufactured by Suzuki Powertrain India, an SMC subsidiary that’s based beside Maruti Suzuki India’s Manesar plant. Suzuki Powertrain India produces a 1.3-litre diesel engine, but SMC does not plan to use it in the new production car since the new 1.0-litre petrol engine is environmentally superior. SMC is ready to study options for small diesel engines from Suzuki Powertrain India in future. Given the importance of India to the Suzuki world strategy, it is planed to invest ¥200 billion for plants in India from 2007 to 2009. (This investment includes capital expenditure for production of the new world strategic model.) Also, it plans to expand Maruti Suzuki India’s production capacity to 960,000 units per year by March 2010 in line with growing demand in India and a vision of exporting the new world strategic model from India to markets around the globe. Further, Maruti Suzuki India is, thanks to transfers of automobile technology and know-how from SMC, distinguished by a research-and-development division that enables it to conduct the specification development, technical adaptation and tuning for the Indian market with SMC’s guidance in addition to production of vehicles designed in Japan. SMC plans further investment in Maruti Suzuki India to expanding the research-and-development division into one that will play a key role in the Suzuki world strategy. The Concept A-Star is the first concept car in which designers from Maruti Suzuki India’s research-and-development division have been involved from the initial stage for its styling. As such, it’s an excellent showcase of Maruti Suzuki India’s capabilities.